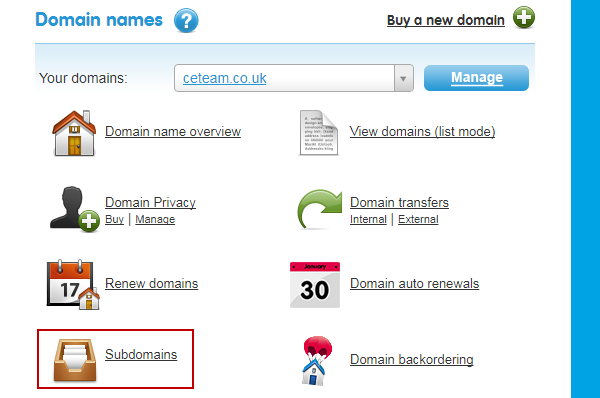 Home » Domain Names » How do I buy a subdomain? How do I buy a subdomain? The below instructions will show you how to create subdomains through your 123 Reg control panel. Subdomains are used to compartmentalise areas of a website, or to offer different versions of the same website. For example, you could use a subdomain to separate your online shop from the rest of your domain, using store.mydomain.com. Or, you could use en.mydomain.com and de.mydomain.com for English and German language versions of your site respectively. Click on the Subdomains option in the Domain names section. Enter the quantity of subdomains you require, and then click on the Buy Subdomains Now button. Type in a name for the new subdomain. Lastly, click on the Add Subdomain button. To modify the settings of your subdomain, click on the Subdomains option in the Domain names section, ensure that the subdomain you wish to make changes to is in the drop down box and click on the modify subdomainbutton. How do I point my domain name to an IP address? How do I point my subdomain to my Online Shop? How do I configure a mobile website with Unity Mobile? How do I change my Online Shop Address?